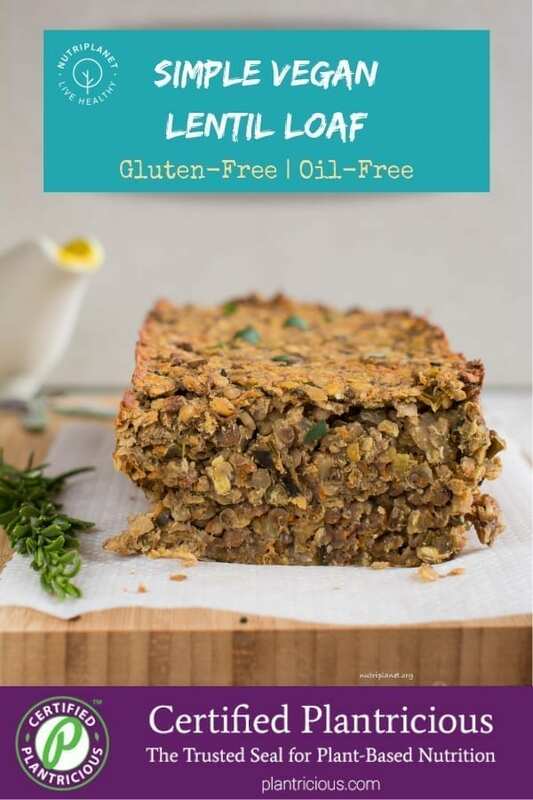 If you need to entertain meat eaters who love their meat loaves (or if you used to be one yourself), give this vegan lentil loaf a try. Of course it doesn’t mimic the consistency of a real meatloaf, but it is super tasty and hearty excellently satisfying the cravings for comfort food. 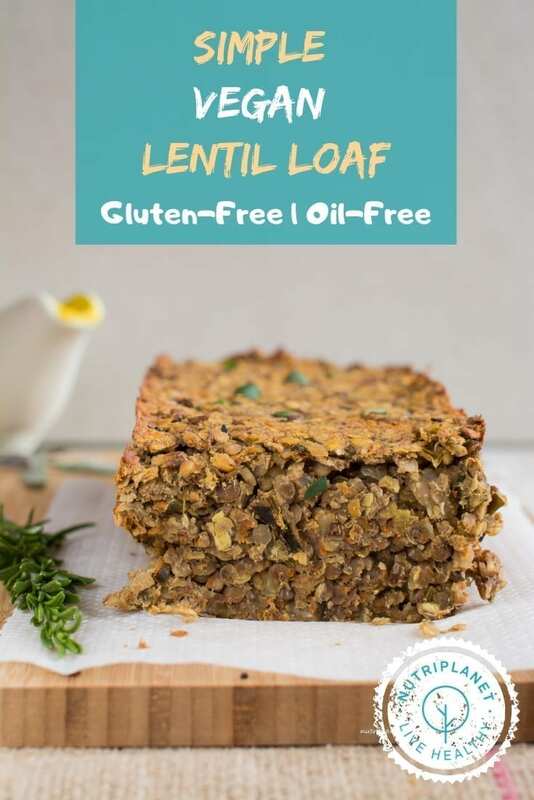 I love this recipe, because it doesn’t use myriads of foodstuff, but sticks to a few simple ingredients that constitute the core of this vegan lentil loaf, namely red and brown lentils. The latter is complemented by the flavours and consistency of onion, garlic, celery and Mediterranean herbs such as thyme, sage and rosemary. I simply can’t get enough of the fragrance that spreads across the room when the herbs are added to saucepan. 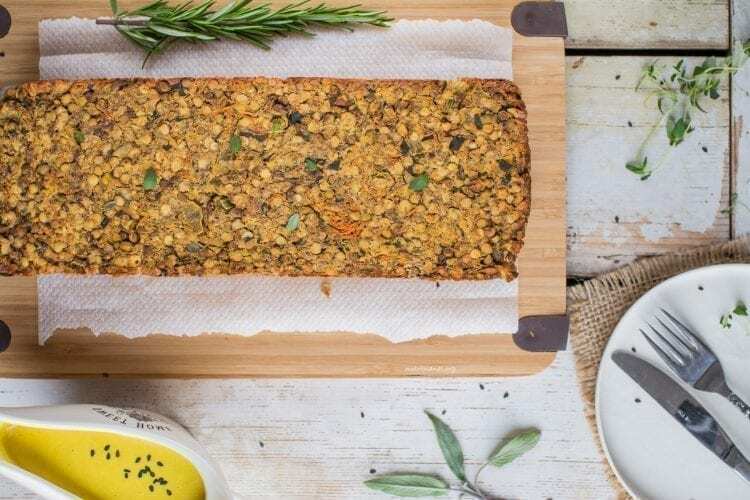 In addition, this vegan lentil loaf recipe fits perfectly on a festive table like vegan Thanksgiving or Christmas as well as ordinary business week dinner table. In fact, you can make a bigger batch (if your household has a large number of people) and freeze the loaf slices to have an easy and quick week night dinner. So yummy with my Tahini-Chickpea Dressing! How to cook legumes to make them more digestible. Cautions to be aware of with kombu seaweed. 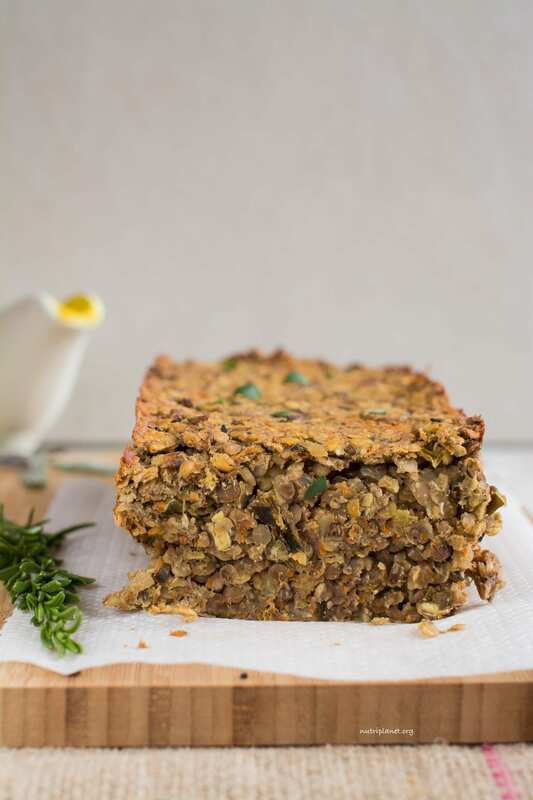 Recommendations for serving this vegan lentil loaf. Substitution tips on the recipe. First, you definitely need to soak them. The problem with dry lentils is phytates that inhibit mineral absorption and cause digestive ailments. Soaking and sprouting activates enzymes and significantly decrease the levels of phytic acid. Secondly, add an acidic medium (1 tablespoon of apple cider vinegar or lemon juice per each cup of dried lentils) to soaking water to mimic soil’s acidity. Finally, add bay leaf and kombu seaweed for extra flavour and better digestibility. When kombu is boiled in water for 15 minutes it can lose up to 99% of its iodine content. That being said, it should be quite safe to add kombu when cooking legumes and discarding the cooking water later. It’s interesting to know that according to Thyroid Research Journal, by combining information from dietary records, food surveys, urine iodine analysis and seaweed iodine content, they estimate that the Japanese iodine intake – largely from seaweeds – averages 1,000-3,000 μg/day (1-3 mg/day). Requiring only well-known ingredients (except for kombu, which you can easily leave out). Fills your kitchen with heavenly Mediterranean flavours. Great recipe for batch cooking and freezing. Use sodium-free broth powder or Mediterranean seasoning mix. Start by preparing the dried lentils. First, wash them until the water is clear and then soak for 6-8 hours. The lentils will soak in about 1½ cups of water. For more health benefits, add 2 tablespoons of apple cider vinegar or lemon juice to soaking water. Next, rinse the lentils thoroughly. Then, drain them and add 3 cups of water and 2 teaspoons of broth powder (we’re going to cook the lentils in plenty of water as we’re after mushy result). Additionally, throw in a 2g piece of kombu seaweed and a bay leaf to enhance flavours and mineral content as well as ease the digestion. Now, bring the lentils to boil. Then, reduce heat and cook until soft, about 15 minutes. Feel free to use broth powder with sea salt, if you’re not concerned about sodium content. Finally, when the lentils are cooked, remove bay leaf (discard) and kombu seaweed (keep for later). Drain the excess liquid (you’ll get about 240g, 8.5oz of broth) by placing the lentils into a sieve. Use the discarded broth in other dishes (soups, stews, dressings, sauces). Chop kombu seaweed into small pieces and add back to the lentils. While the lentils are cooking, finely chop onion, celery and herbs; shred the carrots and crush garlic cloves. Then, heat up a few tablespoons of water in a skillet or large pan. After that, throw in chopped onions and celery. Sauté the veggies with the lid on until softened, about 3 minutes stirring every now and then. Add splashes of water whenever necessary. Now, add shredded carrots, stir and sauté for another 3 minutes. Add splashes of water when needed. Finally, throw in crushed garlic, chopped herbs and smoked paprika. Give it a stir and simmer for another few minutes. Set aside, covered. Pour drained lentils into a large bowl along with chopped kombu seaweed. Next, add the veggie mix and stir well. Then, throw in ground chia seeds (definitely grind your own seeds) and give it another good stir before adding chopped walnuts and buckwheat flour. Mix well until you have a nice mushy and homogeneous batter. Finally, season with Himalayan salt and black pepper. Heat oven to 190°C (375°F). Then, line a 31x12cm (12×5”) loaf pan with parchment paper (it doesn’t matter if the size differs a bit, the volume should be about 1.7 litres, 57.5 fl.oz). Firmly pack the batter into loaf pan and bake for 1 hour. Let the baked loaf sit for 5 minutes before lifting it onto folded kitchen paper to cool. Wait at least 30 minutes before slicing. Nutritional info per ⅛ of recipe: 242 kcal, 30.7g carbohydrates (62.2% of kcal), 5.44g fats (20.2% of kcal), 14.1g protein (23.4g of kcal), 6.94g fibre, 267μg iodine, and 9.6 GL points. Nutritional info per ⅛ of recipe (Plantricious version): 240 kcal, 30.5g carbohydrates (62% of kcal), 5.41g fats (20.3% of kcal), 14.1g protein (23.4g of kcal), 6.83g fibre, 234mg sodium, and 9.6 GL points. Wondering what the Plantricious version is all about? Read all about it here. Have the loaf with plenty of greens, i.e. Romain lettuce and/or steamed leafy greens (kale, pak choi, chard, collard greens, spinach). 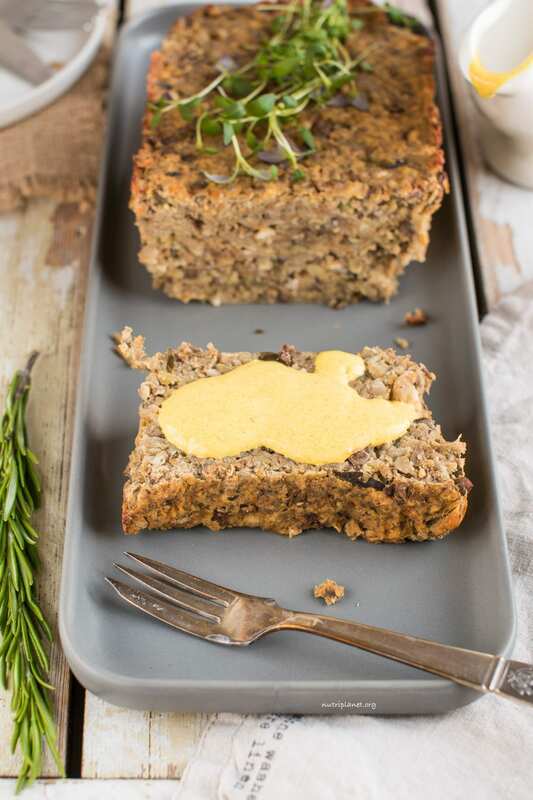 Oven roasted vegetables make a delicious addition to a slice of lentil loaf. Think of bell peppers, cauliflower, beetroot, parsnip, carrots, turnip, fennel, eggplant, summer squash, pumpkin, sweet potato, potatoes, and mushrooms. Steamed veggies such as broccoli and Brussels sprouts would also be on spot. Or make yourself a really comforting bowl with mashed potatoes or a mix of potatoes, sweet potatoes and/or cauliflower. 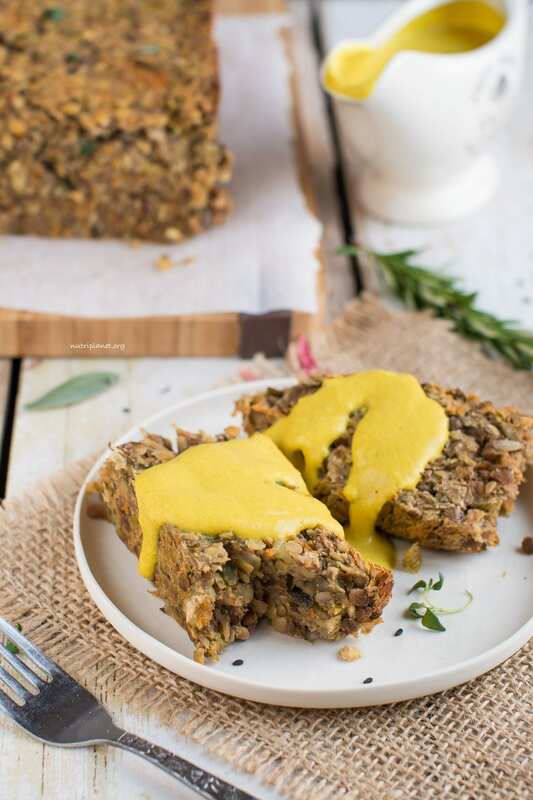 My favourite sauces for lentil loaf are Tahini-Chickpea Dressing (on photo) and Oil-Free Veggie Sauce. A store bought BBQ sauce would also be an option, but be sure to check the ingredient label for added salt and sugar. 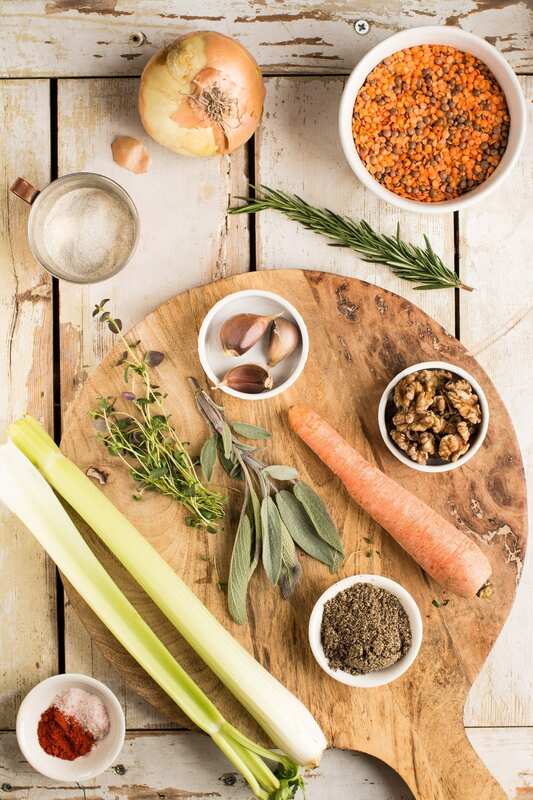 If you don’t have time to soak the lentils, wash them thoroughly until the water is clear and cook them in 4½ cups of water for 25-30 minutes. You may also use 4½ tablespoons of ground flax seeds instead of chia seeds. Feel free to substitute walnuts with any other preferred nuts, e.g. almonds, hazelnuts, or pecans. I like to add chopped nuts for the crunch. Instead of using parchment paper, you may also grease the loaf pan with olive oil, or even better with avocado oil or coconut oil that have higher smoke point (the temperature at which the fats begin to break down and turn into smoke). Although the smoke point for extra virgin olive oil is around 190–207°C (374–405°F), i.e. more or less the same as the temperature in oven, I wouldn’t risk it and use refined (smoke point 199-243°C, 390-470°F) or virgin olive oil (smoke point 210°C, 410°F) instead. 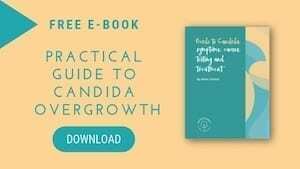 If you’re struggling with Candida overgrowth, choose yeast-free and sugar-free vegetable broth powder. Should you not be able to find one, go for Mediterranean seasoning mix. Finally, buckwheat flour can easily be substituted with oat flour or teff flour. If you consume it 2-3 days, cover the loaf pan with a lid (if the pan comes with one), plastic wrap, wax paper or wax cloth and store in refrigerator. Should you want to keep the loaf for longer, slice it up and store in freezer for up to a month. Heat the individual slices up in oven whenever needed. How to print this out without wasting so many pages of paper? Other sites usually print out on one page. Yes, we’re looking for a better recipe plug-in that’d also have print option. I really hope we’ll get it up and running soon! Wouldn’t it be an option for you to open the recipe in your phone or tablet? This is what I personally do — phone is small enough not to be a nuisance in the kitchen.